LOS ANGLES -- The day has arrived for many adoring LA fans to witness the new-look Lakers for the 2018-2019 season as it unfolded on Media day at the UCLA Health Training Center in El Segundo, Los Angeles, California. This came after much anticipation after the Lakers won the LeBron lottery this past summer. Shortly after the prized acquisition was signed, veterans like Rondo, Stephenson, Beasley and McGee, immediately signed up with the Lakers as well. Magic Johnson, the Lakers President of Basketball Operations, and GM Rob Pelinka emphasized the need to strive for excellence and a whole new dynamic of bringing back the championship culture as the primary goal for the Lakers. For his part, Lebron James, to whom the burden of this storied franchise's destiny has fallen, said that they still have a long way to go towards winning a championship. When asked if the team is capable of beating the Warriors, he responded, that “the Warriors are just gonna pick up where they left off last season, whereas this team (Lakers) has to start from scratch”. In today’s well attended Media day, the message that the Lakers conveyed is that there is now an expectation for them to compete for supremacy in the West as opposed to just trying to reach the playoffs. The Lakers have missed out of the playoffs in the last five years and totally out of the championship picture. 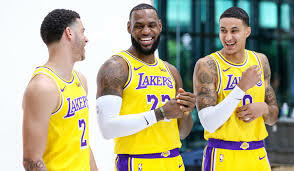 However, the future looks bright, with high hopes that the acquisition of LeBron James and the impact he brings to the team will alter the course.. And, with their young talented core gaining another year of experience, there is reason to be optimistic that the Lakers might just once again become a force to reckon with. Click here to view a list of other articles written by Jonas Davis.